General Corrosion. General corrosion is a uniform loss of material from the surface of the metal and is the most commonly encountered type of corrosion. The metal gradually becomes thinner and eventually loses structural integrity. In many corrosive environments the weld metal may be preferentially attacked because the cast structure of the weld can be quite different from the parent-wrought structure. The designer should deal with general corrosion by selecting optimum construction materials and then assigning a corrosion allowance to the equipment being designed. To avoid preferential corrosion of the weld metal, an over matching filler metal may be selected. Galvanic Corrosion. An electrochemical potential difference usually exists between two dissimilar metal or non-metal conductors when they are electrically connected in an electrolyte. An electrolyte generates an electric current between these two conductors. Consequently, the less noble conductor (the anode) will corrode faster, and the more noble conductor (the cathode) will corrode more slowly, as compared with the behavior of these conductors when they are not in contact. Design is a major factor in preventing or minimizing galvanic corrosion. If dissimilar metals must be used, insulators should be used to prevent electrical contact. The area of the more active material should be larger in comparison to the noble material. Localized Corrosion. Conditions may exist that cause corrosive attack in a very specific location or under a specific set of conditions. Such attack is normally referred to as localized. Pitting, crevice attack, and microbiologically influenced corrosion are all considered localized corrosion. 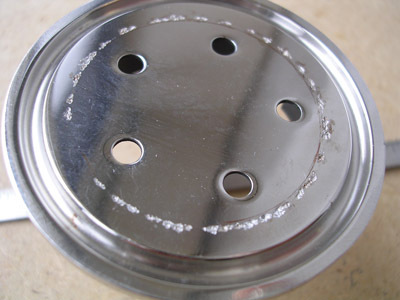 Pitting is a form of very localized attack that results in the formation of holes on the metal surface that can often propagate very quickly, leading to material perforation and failure in a very short period. The micro-environment within the pit itself can be autocatalytic, making this a particularly dangerous form of attack. The chloride ion is considered a particularly aggressive pitting agent for many alloy systems. Crevice corrosion usually takes place in a very tight gap between two surfaces. Similar to pitting, the micro-environment within the crevice can greatly differ from the general bulk environment. Concentration cells can cause this type of corrosion to progress at a very rapid rate. Microbiologically influenced corrosion is responsible for the deterioration of a metal surface through a crevice corrosion mechanism. Certain types of bacteria form dome-shaped colonies on the metallic surface. The inside of the structure is sealed from the outside. The life cycle of the bacteria produces a corrosive environment within the colony, which causes a crevice attack of the metal. Remove arc strikes, weld spatter, and slag particles. Environmentally Assisted Cracking. Some types of corrosion degradation take place as a result of a synergistic effect of chemical environment and mechanical condition of the metal itself. Corrosion fatigue and stress corrosion cracking are the common forms of environmentally assisted cracking. 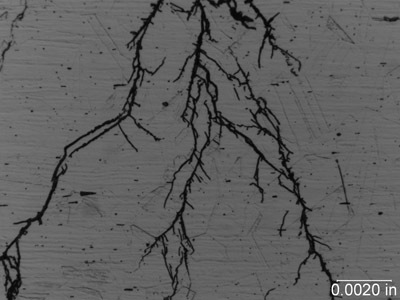 Stress Corrosion Cracking (SCC). This refers to the brittle fracture of a susceptible material under tensile stress in a specific environment over time. During this type of cracking, the metal surface is virtually unattacked over most of the surface, while fine cracks propagate through the cross section. Chloride stress cracking of stainless steel is an example of this type of attack. SCC is insidious because there is usually no manifestation of trouble before cracking appears. Failures of this type can be unexpected and hence hazardous and expensive. It is a major problem in the chemical and petrochemical industry. Corrosion Fatigue. Corrosion fatigue may be defined as a combination of normal fatigue and corrosion that causes failure below the normal endurance limit of the metal involved. Thus it is normally encountered not as a visible degradation of the metal but as a premature failure of a component under cyclic conditions. Intergranular Corrosion. Intergranular corrosion is the selective attack of a metallic component at the grain boundaries by a corrosive medium. 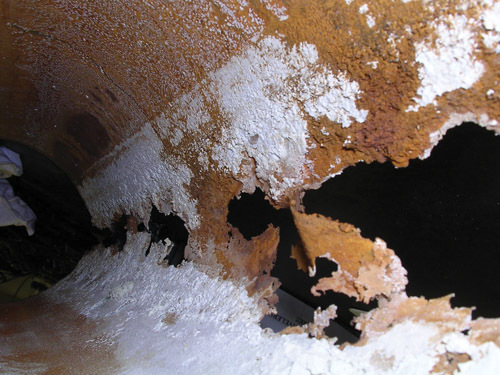 Several conditions can lead to a material being susceptible to intergranular corrosion. Because of thermal mechanical processing, metallic compounds may tend to precipitate and migrate to grain boundaries. If these are more reactive than the metallic matrix, they can be selectively attacked. 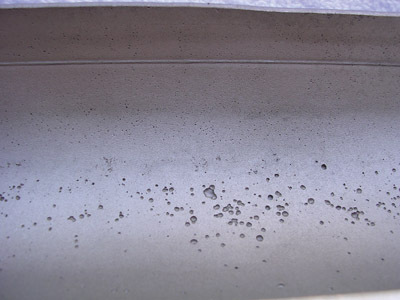 A commonly encountered form of intergranular corrosion is the attack of non-stabilized austenitic stainless steels due to the formation of chromium carbide precipitates and the subsequent depletion of chromium. Do not stress relieve un-stabilized stainless steels in the carbide precipitation range; specify an annealing treatment instead. Specify low carbon or stabilized grades of stainless steel. General corrosion of carbon steel pipeline caused by inadvertent exposure to dilute sulfuric acid. Crevice corrosion of 316L in chloride-containing water under gasket location. 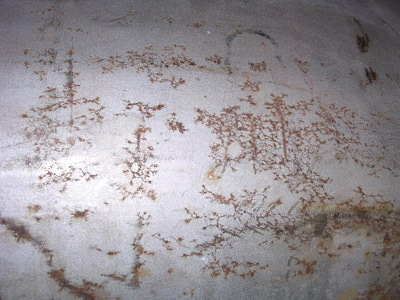 Network of external chloride-induced stress corrosion cracks in insulated 304L pipe. Metallographic cross section through cracks shown in previous image, showing the typical transgranular chloride stress corrosion cracking. Chloride-induced pitting corrosion of 316L stainless steel.